Please take a few minutes to read the details below as it contains some very important information vital to a safe and enjoyable holiday. 1. Accidental Damage Deposit: On arrival at our Guesthouse you are required to pay an Accidental Damage Deposit of 500€ per rider (in cash) to cover damages to any of the motos or equipment. This will be returned in full at the end of your tour, provided no damage has been caused. Most of us have dropped our bikes at some stage of our riding career and we have found Enfields to be very forgiving in this respect. Minor damage can sometimes be fixed easily in-house but sometimes it can not. If any of the motos or equipment is damaged and cannot be repaired in this manner, unfortunately you will be liable for the cost of the repair and this will be deducted from your Accidental Damage Deposit. Thankfully this is a rarity!! 2. Airport Transfers: We prefer our guests to arrive/depart to/from the airports between 9:00am and 9:00pm (if possible, around midday). Due to the logistics involved there will be one airport transfer per day, maximum two. Normally when we have guests arriving on separate flights we try and liase with them regarding their flight times, this way no-one has an unacceptable length of time to wait at the airport for the next members of the group to arrive. We do understand that sometimes this is not possible but unfortunately double runs to the airport and any airport transfers before 9:00am or after 9:00pm will incur an additional surcharge of 50€. Airport transfers are only provided for guests participating in tours of five days or more, if your holiday is for less than five days the additional surcharge will apply. 3. Driving Licence, IDP and Passport Requirements: All riders must be in possession of a valid (category A) motorcycle licence for at least two years, be over 25 years of age and have experience riding on twisty roads, ideally in mountainous terrain. Please check with your home country if it is necessary to have an Internationl Driving Permit for Spain and also check your passport is valid for the duration of your holiday. Enfield Classic Moto Tours (also refered to in this document as OUR, WE, US, OURSELVES ) do not accept responsibility if you cannot travel because you have not complied with any passport requirements. Citizens of the following countries do not require a visa to enter Spain: Andorra, Argentina, Australia, Austria, Belgium, Bolivia, Brazil, Brunei, Bulgaria, Canada, Chile, Costa Rica, Croatia, Cyprus, Czech Republic, Denmark, Ecuador, El Salvador, Estonia, Finland, France, Germany, Greece, Guatemala, Holland, Honduras, Hungary, Hong Kong, Ireland, Iceland, Israel, Italy, Japan, Latvia, Liechtenstein, Lithuania, Luxembourg, Macao, Malaysia, Malta, Mexico, Monaco, Nicaragua, Norway, New Zealand, Panama, Paraguay, Poland, Portugal, Republic of Korea, Slovakia, Slovenia, San Marino, Singapore, Sweden, Switzerland, Uruguay, United Kingdom, United States and Venezuela. So far, as a result of the EU referendum (Brexit) there has been no changes to the rights and status of UK passport holders wanting to enter Spain. 4. Travel/medical insurance: We cannot stress enough the importance of you taking out adequate (travel/medical insurance - UK Clients), (travel/medical insurance - International Clients) against cancellation charges, unexpected curtailment of your holiday, loss or damage to luggage, personal liability claims against you and medical expenses arising overseas. The type of travel/medical insurance needs to be applicable to the type of tour or motorcycle you are due to ride. Should you elect not to effect suitable travel/medical insurance cover despite this advice, then you undertake on behalf of yourselves and all members of your party to indemnify both ourselves and our agents and representatives (as applicable) for any costs that arise which would otherwise have been met had such insurance cover been taken out. 5. Your Holiday Contract: When you make a booking you undertake that you have the authority to accept and do accept these booking conditions on behalf of yourself and your party. A contract will exist upon Enfield Classic Moto Tours accepting any monies from you towards the booking. These conditions, in conjunction with the information set out on our website, form the agreement between ourselves, yourself and your party. 6. Making A Booking: When you make a booking, you will be required to pay a deposit of 20% of the total cost per person to secure your booking. A confirmation Invoice/Receipt will then be sent to you setting out the balance due, which must be paid in full (either in advance via Bank Transfer or in cash on arrival at our HQ) before any tour can commence. 7. Amendments By You: If you wish to change your plans prior to departure, in any way and we can accept the change, these instructions must be sent to us in writing, from the person who made the original booking a minimum of seven days prior to departure. If you are travelling within seven days and wish to change your plans in any way, we might not be able to accept the change. Please be aware some amendments might incur a surcharge (eg. change of accommodation arrangements). 6. If You Cancel Your Booking: You or any member of your party may cancel a tour up to thirty days before the commencement date and a full refund will be given to you or any member of your party providing that the cancellation is made in writing by the person who made the original booking and is communicated to us directly. Refunds are only given to the person who made the original booking. 8. If We Amend Your Booking: It is unlikely that we will have to amend your booking. Occasionally changes may be made which we reserve the right to do at any time. Most of these changes are minor and we will advise you at the earliest possible date. All details given to you are for guidance only. You may decide whether or not to accept the change although you must let us know by return. 10. Conditions Of Accommodation: When you book accommodation (whether provided by ourselves or not) its availability or provision is subject to the 'house rules' of the hotel or other accommodation providing or undertaking to provide such accommodation. 11. Conduct: We reserve the right in our absolute discretion to terminate your holiday arrangements without notice should your behaviour be such that it is likely in our opinion to cause distress, damage, annoyance or danger to any other person. In such circumstances, no refund or compensation will be due to you. 12. Complaints: We do our very best to ensure that your travel arrangements go according to plan. However, if you have a complaint arising out of what we have agreed to provide for you, then please let us know at the earliest opportunity. If a problem arises during your holiday, it is important that you advise the supplier and/or our representative at the earliest opportunity who will endeavour to put things right. If your complaint cannot be resolved locally you should advise us within 28 days of the incident, in writing, giving all relevant information. Your letter will be given prompt attention. If you fail to follow this simple procedure we cannot accept responsibility as we would have been deprived of the opportunity to investigate the matter and hopefully rectify any problem. 13. Excursions: Excursions or other tours that you may choose to book or pay for while you are on holiday, are not part of your holiday provided by us. For any excursion or other tour that you book, your contract will be with the operator of the excursion or tour and not with us. We are not responsible for the provision of the excursion or tour, or for anything that happens during the course of its provision by the operator. 14. Photos & Videos: We may use some of the photos and videos taken while out on tour for promotional purposes (both digital and printed). If you do not want to be famous, please let us know before the tour commences and we shall respect your privacy. 15. 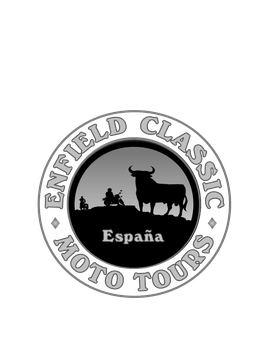 Applicable Law: The contract between you, your party, Enfield Classic Moto Tours and these booking conditions are governed by and construed in accordance with the laws of Spain. In the case of any dispute that cannot be settled amicably, both yourselves and ourselves agree to submit to the exclusive jurisdiction of the courts of Spain. 16. Passport, Visa and Immigration Requirements: Your specific passport and visa requirements, and other immigration requirements are your responsibility and you should confirm these with the relevant Embassies and/or Consulates. Most travelers who want to visit Morocco can do so without applying for a visa if your trip will not exceed three months. However, it is essential that all travellers arrive with a passport that is valid for at least six months from the time you enter Morocco. We do not accept responsibility if you cannot travel because you have not complied with any passport, visa or immigration requirements. Health Precautions: You must ensure by consulting your own doctor, if it is necessary, for you to take specific health precautions deemed prudent for Morocco and to acquire the appropriate medication/inoculations if needed. 17. a) Data Protection Policy: Please be assured that we have measures in place to protect the personal booking information held by us. This information may be passed on to the principal and relevant suppliers of your travel arrangements (i.e. ferry companies organising travel to Morocco, hotels both in Spain and Morocco.) The information may also be provided to public authorities such as customs or immigration if required by them, or as required by law. If you travel outside the European Economic Area, controls on data protection may not be as strong as the legal requirements of this country. We will only pass your information on to persons responsible for your travel arrangements. If we cannot pass this information to the relevant suppliers, whether in the EEA or not, we will be unable to provide your booking. In making this booking, you consent to this information being passed on to the relevant persons. Please be assured your details will not be added to any third-party mailing lists.